S6 to S7 @ tune-in with "Rock The Casbah"
Nice signal, s9 into NE Ohio, playing Rock The Casbah by The Clash. 2135 About an SIO 433 signal. 2137: Pete Wild "Spider Mother"
2140: Jonas Brothers "L.A. Baby (Where Dreams Are Made Of)"
2143: Taylor Swift "Look What You Made Me Do"
2146: Aussie electrical commercial into DNCE "Cake By The Ocean"
2151: Another commercial that mentioned New Zealand into Whitney Houston "Greatest Love Of All"
2153: Near & Dian Sorowea "Karna Su Sayang"
2154: Aldi Nada Permana "Ingin Tetap Tinggal"
21:37 Pete Wild Spider Mother. 21:43 Taylor Swift Look What You Made Me Do. Aussie OM speaking into next song. 21:51 Whitney Houston song...cut off Greatest Love of all. 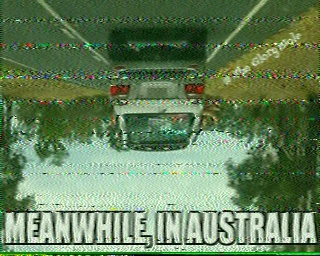 21:55 More Aussie OM Hard to understand on USB. Hodge Podge of songs and cut offs. 22:00 Time interval bells back into techno beat with touch tones. OM in spanish I think? Foreign sounding 22:03 song...unknown language. More OM in another language. All of my Love...Robert Plant. Time for snow...the yellow snow. WX storm warning weather report WTOP radio. 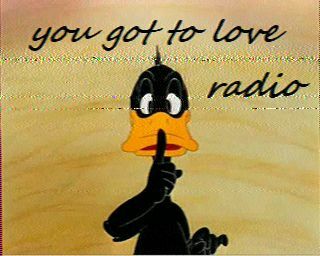 listen to this station Radiodomy.com. its at 6934.98 for anyone who wants to zero in on it. 2147 - S3 and weak here in Eastern Mass. Good signal here, stronger than many pirates of late. Thanks for the show! 2152 UTC - Signal S7-S9 in WNY, audio is good at peaks. 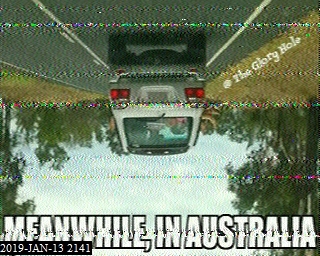 2137 Music, some ads, talk, SSTV (Upside down car with "Meanwhile in Australia"), series of short starts of songs. Maybe same show again? Sound montage into songs. Signal is great. Clear and loud audio at +10 periodically. Thanks for the show. 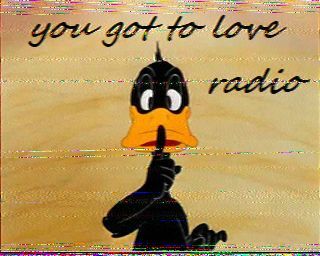 Late post of SSTV images.